In this tutorial I’ll show you how pin waves were made in the Edwardian era. 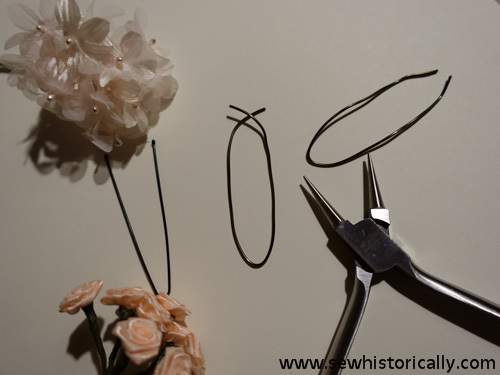 You can use hairpins, like the one on the left, to make Edwardian pin curls, or make your own wire curlers. Cut your craft wire slightly longer than a hairpin and bend it like the one on the right. After you’ve washed your hair, let it air-dry till it’s still slightly damp. Or use a spray bottle to dampen your hair. 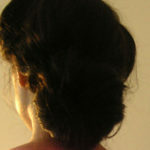 Then bend the ends of the pin so that they cross each other to secure the strand of hair. 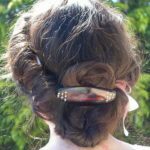 If you’ve used a hairpin, secure it with a hair elastic. 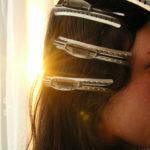 Wrap the next strand of hair in a zig-zag shape round the wire curler. Pin wave or marcel wave the hair? ‘Waving is not all of the Marcel type ; indeed, it is practically impossible for a woman to Marcel wave her own hair. But there are other ways of securing an excellent wave on the front and side hair ; a wave which looks pretty and natural, and gives the hair just that support and substance which makes waving such a help in hair dressing. 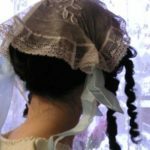 Every woman can wave her hair, if she wants to, on pins.’ (Every Woman’s Encyclopaedia, 1910-2a) It is ‘interesting and instructive to remember that in the days of Madame la Pompadour all waving was done on pins or en papillote, as marcel waving was then unknown. Therefore, the wave made on pins is far nearer the original Pompadour style than the marcel wave.’ (Every Woman’s Encyclopaedia, 1910-2b) ‘I do not want ladies to think that this process – which needs no helper or maid – will give them the same appearance as a Marcel wave. It will not. But it will wave their hair’. Curling the hair on pins ‘cannot possibly harm the hair [as marcel waving might]; and they will produce a far more natural, wavy result than badly manipulated tongs or so-called ” wavers.” Indeed, they offer the nearest home-made approach to a Marcel wave.’ (Every Woman’s Encyclopaedia, 1910-2a) Wire hair curlers were advertised as ‘”La Donna” French Crimping Pins, no heat necessary’ in Eaton’s Spring And Summer Catalogue 1904.